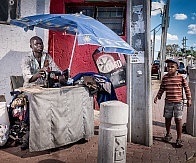 Recent attacks on foreign migrants working in the informal economy make it clear that the problems that erupt regularly are far from resolved. Yet new research shows many of the beliefs about immigrants to be false. "Music chooses you, and not the other way around," says flautist and lecturer Dr Liesl Stoltz, about how and why she recorded the first CD of flute music by South African composers.